Isn't iGoogle dead since Google+ emerged ? This thing sucked so bad for so long I really thought it was dead. Does anyone actually use it? How about Google Reader? 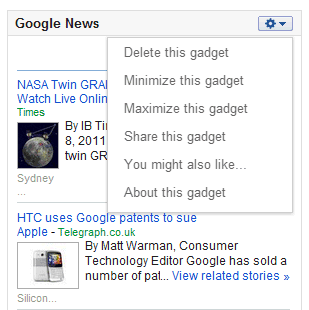 When is it going to be integrated with G+? 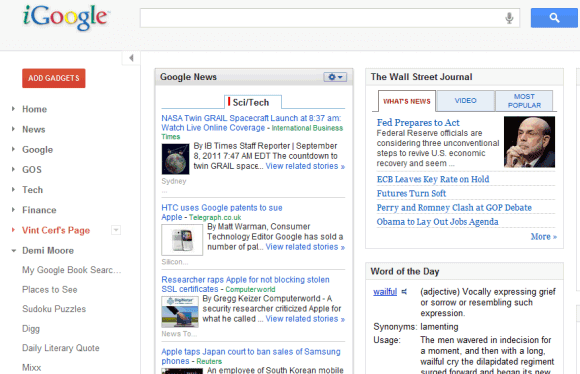 I use iGoogle as my main page - with Reader, Docs, Gmail, Calendar, Evernote, sports schedule, stock prices, and more on it. It's great to stay organized and productive in one tab on one page. @Dave, how do you use Evernote with iGoogle? This update crashed my iGoogle pages. Too much white colour. It is beautiful and better. But why does the G+ status felt. As it is view on all other google products ? I love the fact I had hide the left-hand sidebar, that was a waste of space. Now I hope the reduce the size of the header so less space is wasted there and I don't have to scroll on my laptop screen to see everything at a glance. Looks good Google - keep it up!!!! And how am I supposed to reach advanced search? yap, google reader should be next! Wish we could change the color, too much white. Please let us change the color. Hard to read. How do I access my gmail? Clicking on the gmail header (in my gadget) no longer works. Way way too much white. want option to change background to something else or revert back. Headers should be links as well. Cool. I like that I can hide the sidebar, since I only use iGoogle for its Tea House theme and two complimentary gadgets. There's still some white space at the bottom of gadgets. I really so dislike the tabless IGoogle page. The search bar hides my Eagle that is in the theme on top. Please put it back the way it was. Please stop trying to make things better for us when we were happy campers they way things were. Also the Gmail Themes still don't work no matter what I do or try. Blah.... Google used to be so good. What happened? It will be better to add buttons (to gadgets) to maximize or minimize gadgets. I know Google are going for "less is more", and that's good, but you need to be careful on some pages where the amount of white makes it quite hard to read. I'm really hoping that Google start to roll out a Google-wide themes system, where we can choose themes for individual services or choose a single theme for all services. A lot of us like plain white sites, but a significant number of people don't, and themes would make it better for them. Hate it. But then I DGAS about Google+ either. Why do all these iWonks make me want to be more social than I feel like being? Leave my social life alone. Now I need a new homepage. Why remove the 'language' tool? Found it pretty useful. I am not sure if anyone is still interested to use iGoogle. I am quite sure, it is the next service which Google is gonna end soon. How can i add my site in igoogle gadgets?its become wonderfull if i can add one or two my sites in gadgets which i want to use frequently like my office mail box,my company's notification site etc. Don't blame Google for your monitor being too bright. I mostly like it but that Send feedback button has to go or I will be gone. I have tried everything I can think of to hide it and faile...so I guess it is time to move on to a different portal.